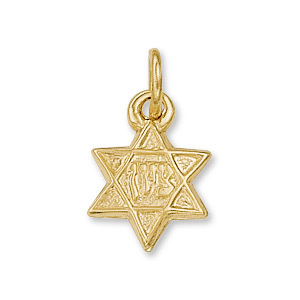 This star of David charm is petite, less than half the size of a dime. Polished 14kt yellow gold. Dimensions: 7.5x7.0mm. Weighs .38 grams. Please note: weight is approximate, actual weight may vary. Chain not included. Bail size: 1.6mm x 1.25mm; we recommend a chain no wider than 1mm.